The most innovative companies rely on technology to move faster and more efficiently than their competitors. With rapid advances in available technology, limited IT resources and departmental budget constraints, how can IT keep up with demands to help the business remain productive without breaking the bank? Flexible software applications, such as Cherwell Service Management, help diverse lines of business remain in sync and work together toward common business objectives. In this Playbook, we will explore a variety of organizations that have embarked on new ways of using IT Service Management technology to support and accelerate growth. 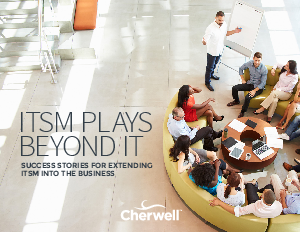 Leaders from top worldwide organizations share how they have extended Cherwell Service Management to manage processes, build inviting customer experiences and accelerate success quickly and efficiently.